In 2015, TU increased its efforts to restore cold-water streams in Michigan, the origin place of the organization. Great efforts on the Rogue River have been under way for the past few years, and during the last two years additional TU staff members have been prioritizing and implementing habitat improvement projects and increasing stream connectivity in high-quality trout streams in the Northern Lower Peninsula. 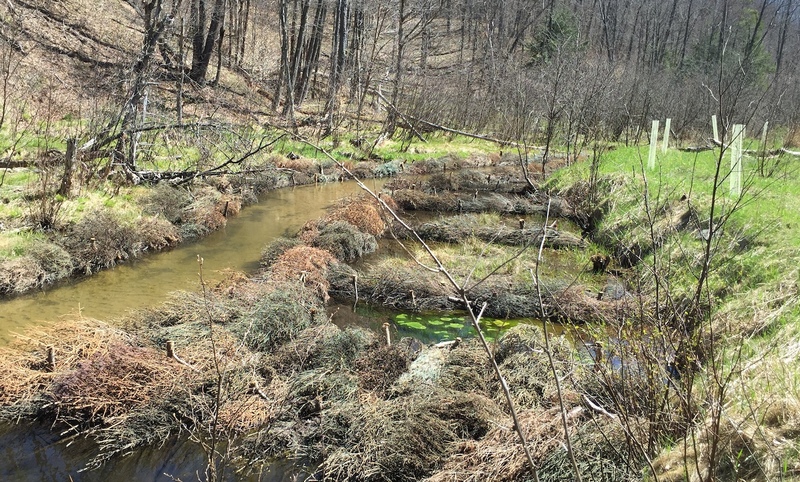 TU and area partners have added wood habitat and restored stream-channel form and function throughout more than 5 miles in the Little Manistee River (above), tributaries to the Pine River (Northwest Lower Peninsula) such as Poplar Creek (below) and in the upper Manistee River. The work will benefit both the rivers’ wild trout and wild steelhead that use the system as a nursery. Trout Unlimited members assisted in riparian restoration through native tree and shrub plantings to complement the in-stream work. In addition, TU, in close partnership with the local Road Commission, improved connectivity in the Middle Branch Pere Marquette, by replacing an undersized (relative to stream channel width) failing concrete bridge with a clear-span timber bridge that spans the stream width. Looking ahead, TU plans to restore and reconnect over 40 miles of cold-water habitat in 2017-18 to help improve Northern Michigan trout streams for current and future anglers. Trout Unlimited has worked closely with area partners such as local conservation groups, local governments, Michigan Natural Resource agencies, and the Huron-Manistee National Forest staff to implement priority restoration projects in top-quality trout streams in Northern Michigan. The good work being done could not have been accomplished without the support from the Great Lakes Restoration Initiative through the USDA Forest Service Region 9, the Huron-Manistee National Forest and the National Fish and Wildlife Foundation -- Sustain Our Great Lakes. Additional support comes from the Michigan Department of Natural Resources, Freshwater Future, Michigan TU and local chapters. Jeremy Geist is Trout Unlimited’s Great Lakes Stream Restoration Manager.